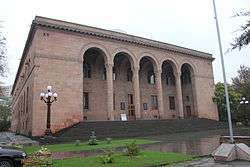 The National Academy of Sciences of the Republic of Armenia (NAS RA) (Armenian: Հայաստանի Հանրապետության գիտությունների ազգային ակադեմիա, ՀՀ ԳԱԱ) is the primary body that conducts research and coordinates activities in the fields of science and social sciences in Armenia. The academy was founded on November 10, 1943 on the basis of the Armenian Branch of the Soviet Academy of Sciences, which was established almost 10 years earlier, in 1935. Among its founders were Joseph Orbeli, Stepan Malkhasyants, Ivan Gevorkian and Victor Ambartsumian; Orbeli became the first president of the academy.